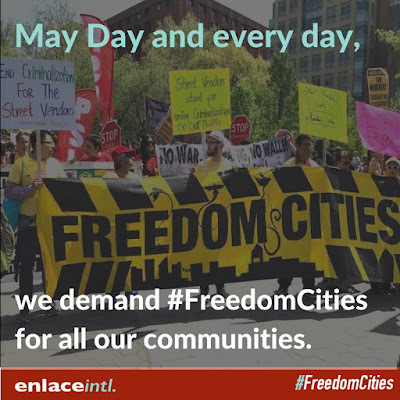 Freedom Cities is about making entire cities, towns, and communities safe for immigrants, Black people, Muslims, Queer+Trans folks, workers, and all oppressed communities. 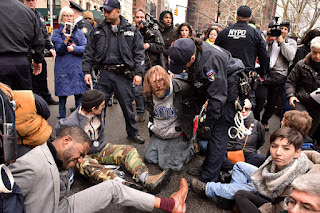 Our liberation is inherently tied together, it's all of us or none of us! 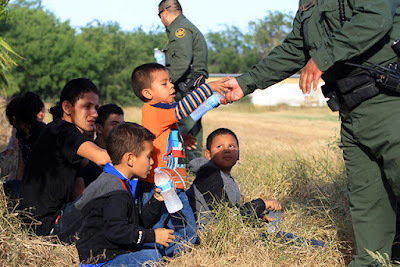 Copwatch Patrol Unit - CPU"
Why Does DHS Want to Prosecute Asylum Seekers With Kids? The Department of Homeland Security has now made it clear that its policy really is to separate parents from their children when they enter the U.S. to seek asylum. The policy will be implemented by prosecuting the parents if they attempt to cross the border anywhere except at a legal port of entry. This comes as a caravan of asylum seekers, mostly from Central America, prepare to cross the border into California today. The Trump administration has hyped the planned entry—by some 100 people, mostly women and children—as some sort of foreign invasion. José Antonio Elena Rodríguez was on Calle Internacional, four blocks from his home in Nogales, when 16 shots punctured the night. Ten bullets struck him: eight in the back, two in the head. He died where he fell. 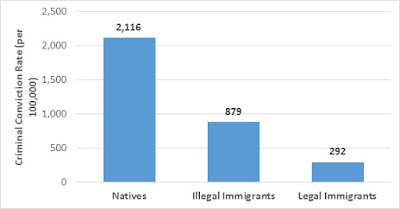 The top 10 offense categories where Secure Communities removals grew the fastest since President Trump assumed office were generally misdemeanors or petty offenses. DACA Update #5: What Does the Latest Ruling Mean? On April 24 DC District Court John D. Bates issued a complicated decision on DACA which many people seem to misunderstand. The short version is that the judge ordered a complete reinstatement of DACA unless the Trump administration comes up with a better reason for ending it. The government has 90 days to improve its original claims, and of course a higher court could overrule Bates. So the decision definitely doesn’t mean DACA recipients are safe. Bates objected to errors in the grounds Jeff Sessions gave last September for rescinding DACA (see DACA Update #2 for other issues with Sessions on DACA). Basically Sessions' problem was that the DACA termination was going to be unpopular, so he wanted to find statutory and constitutional objections to the program instead of admitting the administration just didn't want it. But he botched the job. Presumably the administration could use the 90 days to find a competent lawyer who could construct a better case for ending DACA. Trump calls for militarizing the border—how should we answer him? School of the Americas Watch (SOA Watch) and local organizations are sponsoring two events in New York City this week about ways to build solidarity with Mexican and Central American migrants and activists. 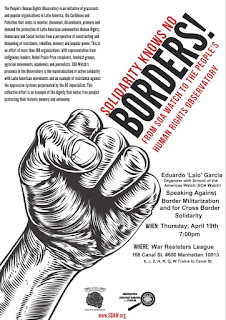 Eduardo Garcia, a national organizer of the School of the Americas Watch, will discuss the transnational solidarity being built around the Observatorio de Derechos Humanos de los Pueblos in Oaxaca, which is an initiative of more than 100 organizations grassroots and popular organizations in Latin America and the Caribbean that seeks to monitor, document, disseminate, promote and demand the exercise of Peoples' Human Rights, Democracy and Social Justice from a perspective of construction and deepening of resistance, rebellion, memory and popular power. 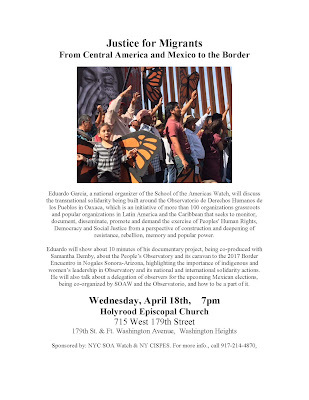 Eduardo will show about 10 minutes of his documentary project, being co-produced with Samantha Demby, about the People’s Observatory and its caravan to the 2017 Border Encuentro in Nogales Sonora-Arizona, highlighting the importance of indigenous and women’s leadership in Observatory and its national and international solidarity actions. 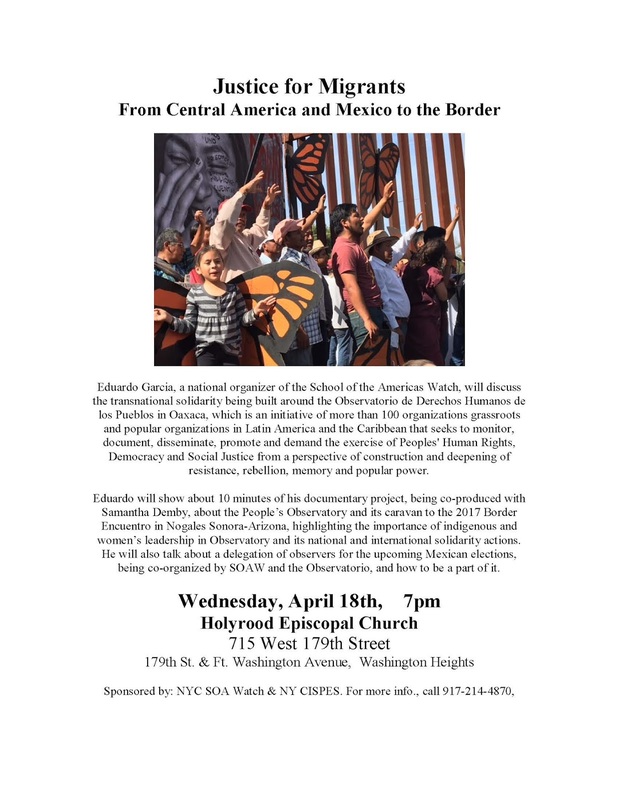 He will also talk about a delegation of observers for the upcoming Mexican elections, being co-organized by SOAW and the Observatorio, and how to be a part of it. The People's Human Rights Observatory is an initiative of grassroots and popular organizations in Latin America, the Caribbean and Palestine that seeks to monitor, document, disseminate, promote and demand the protection of Latin American communities Human Rights, Democracy and Social Justice from a perspective of constructing and deepening of resistance, rebellion, memory and popular power. This is an effort of more than 100 organizations, with representation from indigenous leaders, Nobel Peace Prize recipients, feminist groups, agrarian movements, academics and journalists. 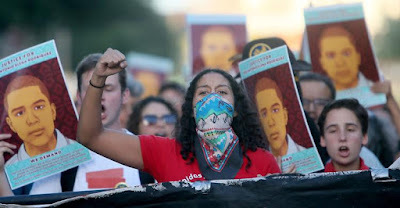 SOA Watch’s presence in the Observatory is the materialization of active solidarity with Latin American movements and an example of resistance against the oppressive systems perpetuated by the US imperialism. This collective effort is an example of the dignity that unites free peoples protecting their historic memory and autonomy. 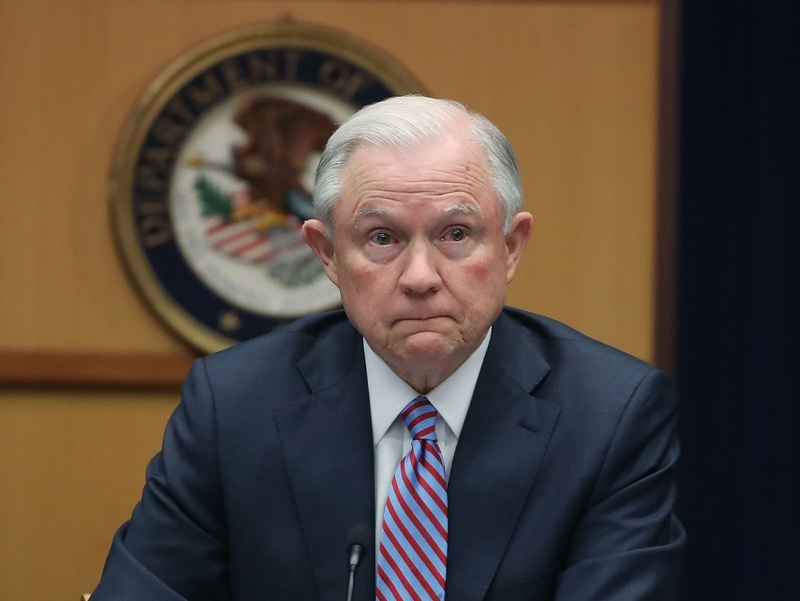 Update 4/26/18: At an April 25 congressional hearing, Jeff Sessions announced that he had changed his mind and wouldn't suspend the Legal Orientation Program, at least for now. The dramatic raid in Tennessee was hardly more than a blip in most national media. Immigration coverage that week had been overwhelmed by a burst of incoherent and fact-free rants from Donald Trump about borders and what he called “ridiculous liberal (Democrat) laws like Catch & Release.” But the raid is an important example of the extent to which the Trump administration has already been able to implement a hard-line anti-immigrant agenda without the need for Congressional approval—and without attracting a lot of attention from the media or the groups that focus on lobbying and electoral politics. One area where the administration has concentrated its efforts is the immigration court system. Despite the name, these courts aren’t part of the U.S. judiciary system; they’re administrative courts operated by the Department of Justice. In other words, an immigration judge is employed by the same executive branch which comes to the court seeking an immigrant’s deportation. This essential unfairness has been detailed neatly by TV satirist John Oliver. But now Attorney General Jeff Sessions is working to make the system even worse. 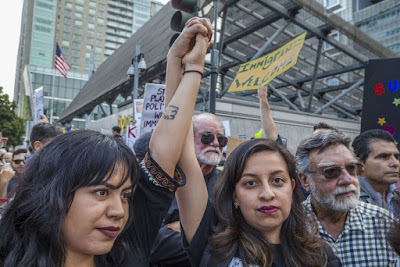 Since the cases brought before immigration courts are civil, not criminal, the government isn’t required to provide the immigrant defendants with lawyers. Since 2003 the Justice Department has sponsored a program (the Legal Orientation Program, LOP) which gives some relief by offering legal advice to about 50,000 immigrants each years. A 2012 Justice Department study found that the LOP actually saves the government money and helps reduce the courts’ backlog, but as of April 10 the department had suspended the program, ostensibly in order to audit its cost-effectiveness. “This is a blatant attempt by the administration to strip detained immigrants of even the pretense of due-process rights,” Mary Meg McCarthy, executive director of the National Immigrant Justice Center, told the Washington Post. The executive branch also has a great deal of leeway in how it handles the detention and deportation of immigrants it targets. There have been many abuses of this power in the past, but the present administration seems on track to set a record. On April 10 the American Civil Liberties Union (ACLU) filed a class action suit in federal court in Boston challenging what it charged was a pattern of the government detaining immigrants as they were applying to the U.S. Citizenship and Immigration Services (USCIS) to gain legal status as spouses of U.S. citizens. The suit cites seven cases in January alone of immigrants arrested while they were visiting USCIS offices in Massachusetts or Rhode Island while engaged in the application process. The government can be equally harsh in the way it treats immigrants once they are detained. Before last December, immigration authorities released most pregnant immigrants while their cases were pending. The Trump administration ended the policy in December, and 506 pregnant women were placed in detention during the first three months of this year. Meanwhile, advocates say the Border Patrol has instituted a policy of separating the families of asylum seekers, leaving even very small children in isolation from their parents. But Trump’s immigration apparatus follows policies still more incompatible with his party’s supposed values. Sometimes it’s hard to see any motive for the government’s actions other than an eagerness to meet arrest quotas—or maybe just nastiness on the part of empowered bureaucrats. The president claims to want “merit-based” immigration, but his immigration agents seem to have no problem targeting well-educated professionals who are already living here. In early April ICE seized a New Jersey physics teacher named Ahmed Abdelbasit and threw him into detention. If deported, Abdelbasit would face a death sentence in his native Egypt resulting from political activism. Earlier in the year ICE agents detained Syed Jamal, a chemistry teacher in Kansas, and an Illinois doctor, Lukasz Niec. Both are longtime residents with U.S. citizen children. Republicans routinely call for “supporting our troops,” but this apparently doesn’t include Miguel Perez, a Mexican-born green card recipient, who served two tours in Afghanistan. 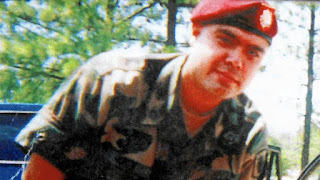 Diagnosed with PTSD after his return, Perez fell into drug abuse, was convicted for an attempted cocaine sale, and served half of a 15-year sentence. 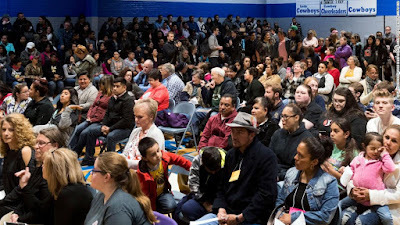 The Obama administration began deportation proceedings against Perez in 2016, but the Trump administration finished the job—despite pleas from supporters, including Senator Tammy Duckworth (D-IL). The veteran was deported to Mexico on March 24 with little more than the clothes on his back. And what about the president’s claim to be protecting U.S. citizens from the MS-13 gang? In 2015 a Salvadoran youth on Long Island decided to quit the gang and help the authorities arrest other members. We might expect the U.S. government to shield the teenager, possibly putting him in the witness protection program in order to encourage future cooperation from others. Instead, immigration authorities placed him in detention and are now attempting to deport him to El Salvador, where he feels sure he’ll be murdered as an informant. 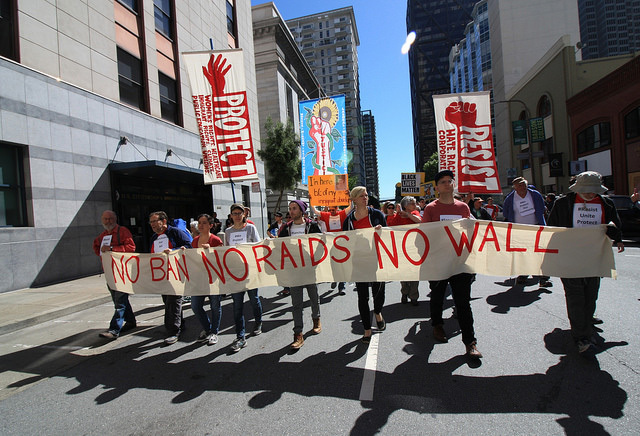 The Trump administration intensified its fight with California last month when the Department of Justice filed a lawsuit arguing that the state's so-called sanctuary laws undermine federal immigration enforcement and are therefore unconstitutional. A few cities and counties in California have also opposed the policies in recent weeks. Despite all the bluster, California is likely to prevail. The Supreme Court's governing interpretation of the 10th Amendment protects the autonomy of states and prevents them from being conscripted into federal enforcement programs. The fact that DACA recipients — and essentially all Dreamers — have become part of the conscience of the country and a critical part of the economy is illustrated by the strong support for them exhibited by major businesses in the United States. Dozens of CEOs from companies like Microsoft, Amazon, Netflix, AT&T, Wells Fargo, Google, and Facebook urged the president to preserve the program. After the Trump Administration announced the rescission of the DACA program on September 5, 2017, even more companies denounced the action and called on Congress to pass the Dream Act before the DACA termination date of March 5, 2018. So far the military coup that removed Honduran president José Manuel Zelaya Rosales from office on June 28 hasn’t produced any noticeable increase in immigration from the Central American country — probably because Honduran workers and campesinos are actively organizing against the coup regime and so far have held it in check. But the situation could change quickly if repression against these grassroots movements increases. 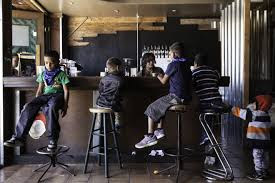 More than a half million people fled to the United States from the region during the 1980s, when the U.S. government was funding rightwing forces during civil conflicts in El Salvador, Guatemala, and Nicaragua. And people may remember the effects of a very similar coup in Haiti in 1991: the repression that followed the overthrow of President Jean Bertrand Aristide drove tens of thousands of Haitians to undertake the dangerous sea journey to Florida in overloaded boats. The article went on to discuss the anti-immigrant rants of James DeMint, then a senator from South Carolina and a favorite of the immigration restrictionist Federation for American Immigration Reform (FAIR). DeMint was a strong supporter of the Honduran coup. 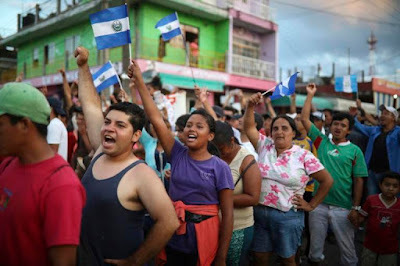 If the coup regime manages to hold on to power, Wilson wrote, and refugees start fleeing their country for exile in the United States, we can be sure Senator DeMint and FAIR will be among the first to ask what part of “illegal” these Hondurans don’t understand. Just as predicted, unfortunately. The names have changed, but the hypocrisy hasn’t. Activism for immigrant rights may be about to get much more militant.